Telangana has an inclination towards celebrating a given occasion with lots of grandeur and glory. 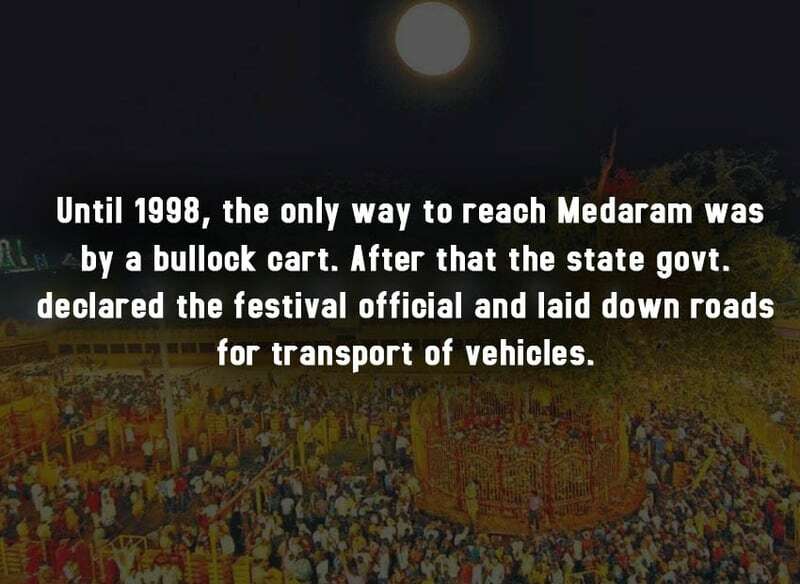 This year’s celebration of Sammakka Saarakka Jathara, where devotees gather in memory of Sammakka and Saarakka at Medaram in the district of Warangal has begun with all pomp. 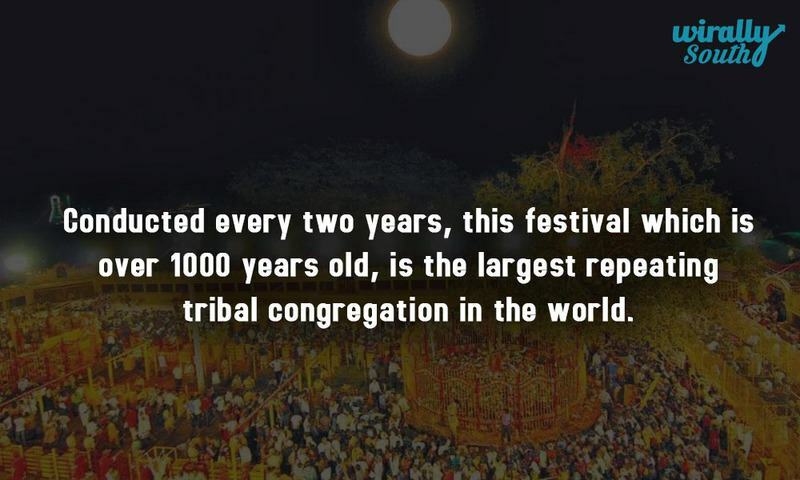 Sammakka Saarakka Jathara (fair) or Medaram Jathara is a tribal festival celebrated twice a year at Medaram. 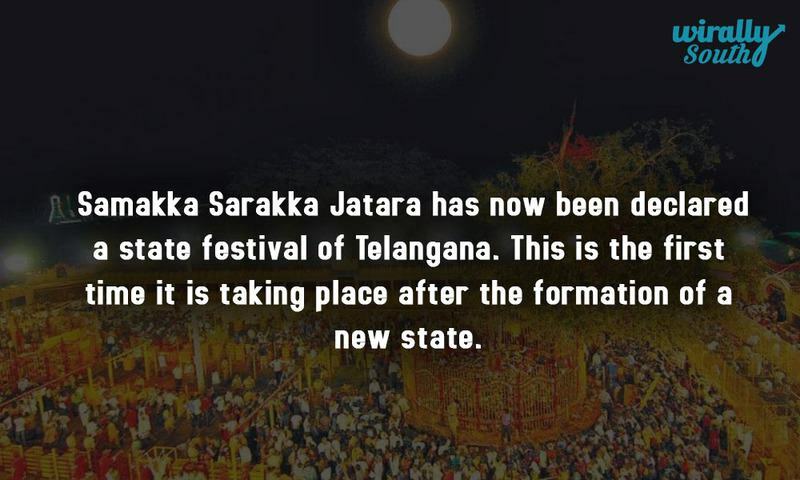 People from Telangana, Andhra, Maharastra, Chattisgarh, Madhya Pradesh come to take part in this Jathara. 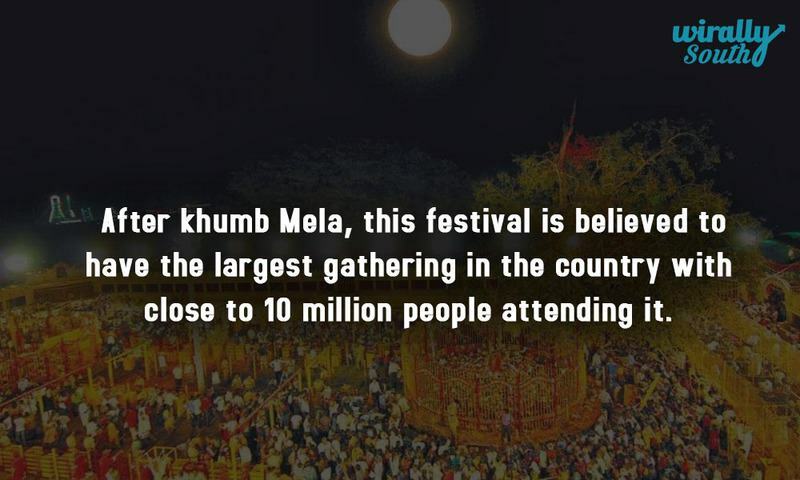 Touted to be one of the largest gathering across the country, this festival takes place for four days (2016 – February 17-20). 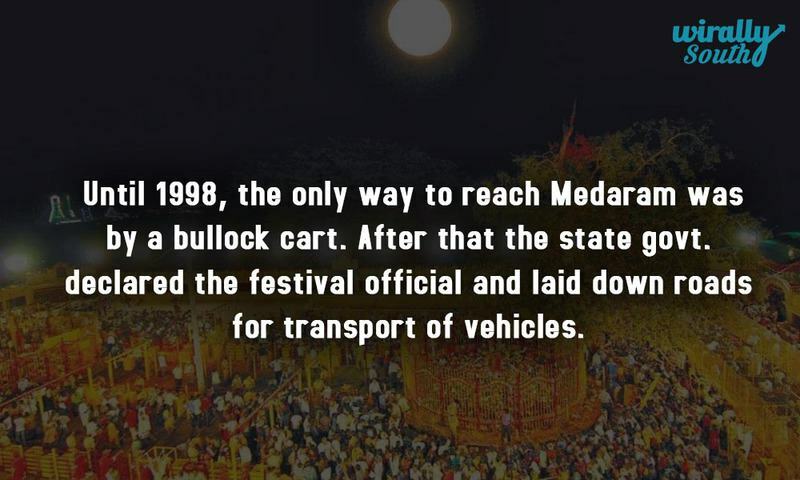 Situated in the Eturunagaram Wildlife santuary, Medaram is a remote village where this festival has been taking place for over 1000 years now. While bangaram (Jaggery) equal to their weight is offered, this place is flooded with devotees during these four days of celebration. The gathering is so huge that the traffic on the Warangal highway extends upto 60 kms sometimes. 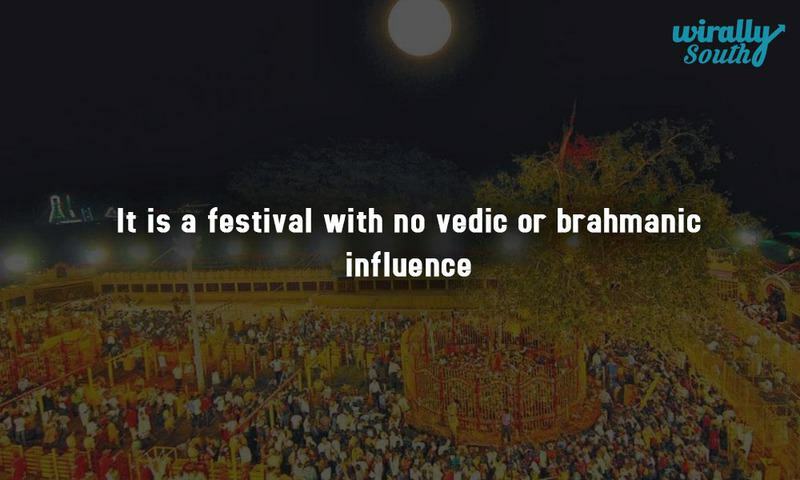 Here we bring to you all that you need to know about this festival: Story behind this festival and few interesting snippets. It was about 6-7 centuries ago when a group of tribals who went hunting into the forest found a baby girl lying amidst emitting light. The head of the tribe adopted her raised her. He got her married to feudatory tribal chief of Kakatiyas. They had three children, Saarakka, Nagulamma and Jampanna. Their region faced a severe drought which dried up their lakes resulting in their head Pagididda Raju (husband of Sammakka) failing to pay their share of tribute to the Kakatiya King Pratapa Rudra. In turn the King Pratapa Rudra sent his army to collect the tribute from tribals. 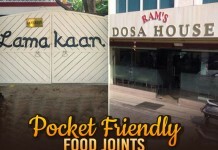 This resulted in a war between the Kakatiyas and tribals. Everyone from Saarakka to Jampanna lost their lives in the battle trying to protect their section. Upon hearing this, Sammakka too joined the forces and fought valiantly and ransacked the Kakatiya army. Shocked by her bravery, the Kakatiya king visited the tribe for peace talks. Being furious about the loss of her tribe, family and people, Sammakka refused to come to terms and continued to fight. She pledged to her people that as long as she is alive she would protect them. She in turn cursed that the Kakaitya kingdom would perish soon. After being seriously injured in the battle and sending away the Kakatiya army, she walked into the forest towards Chilakala Gutta. When the tribals went in search for her, they only found a box containing vermillion (Kumkum), few bangles and a pug mark of a tigress. To their surprise this was the exact place where they found as a baby girl in the forest. Since then the tribes have been hosting a festival in her remembrance for her bravery in protecting their tribe.